- A pavilion with games, fooseball and a ping pong table! 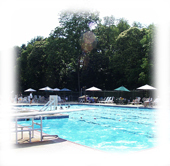 High Point Swim Club is located at 1819 Foulk Road in Wilmington, Delaware, just north of Silverside Road. Please click "View Larger Map Here" at the bottom of the image to open it in Google Maps. June 27th - Green Acres, July 9th - Windy Bush and July 11th - Darley. Members are welcome to use the opposing team's pool. 1. Members must sign-in themselves and guests upon entering the pool area. 2. Members may bring guests to the pool. Members must be present during their guest’s attendance and are responsible for their behavior. Guest fees will be charged for guests ages 3 and up. (Individual guest passes and booklets of 6 passes are available from the lifeguards.) Unused passes will carry over to the next season. 3. No smoking is permitted within the fenced area. Smoking is permitted only outside the fenced area. 5. Food and drinks are permitted within the pool area, but not in the pool proper. Children should eat their ice cream outside the fenced area and messy hands, faces, etc. must be washed before re-entering the pool. 6. No gum chewing, glass bottles or glass cups are permitted in pool area. 7. Each swimmer must shower with soap before entering the main pool. 8. Any person suffering any communicable disease, skin eruption, fungus infection or eye-nose-ear-or throat infection should refrain from using the pool. 9. The baby pool is closed during home swim team meets and practices. 10. On days of home swim meets, the main pool will close early to allow the staff to prepare for the meet. During home meets, members are permitted to use the pool of the opponent team. 11. Children age 9 and older may attend the pool without an adult, if they are able to swim one length of the pool to the satisfaction of the pool management. In order for your child to enjoy this privilege, parents must fill out a request (available from the lifeguards and kept on file), listing phone numbers in case the parent needs to be contacted. 12. Children under 9 must be accompanied by a parent or caregiver of at least 15 years of age. 13. Only children 6 and under may use the baby pool. Direct adult supervision is required for all children in the baby pool area. 14. Children that are not potty trained must wear waterproof diapers. Children not clothed in these “swimies” diapers are not permitted in the baby pool or main pool. NO EXCEPTIONS! 15. All personal injuries, however slight must be reported immediately to the guard on duty. 16. No diving in the shallow end of pool. 17. No running on pool decks. 18. The pool manager or lifeguard on-duty must approve the use of any swimming equipment or floatation devices in the main pool. An adult or guardian must be within 3 feet of any child who is a non-swimmer using a floatation device. Lifeguards may disallow floatation devises if the lifeguard believes that the devise poses a safety risk to the child with a floatation devise or to others, or if the flotation devise is not being used properly. 19. The use of illegal substances on pool property is strictly forbidden. 20. Polite and considerate behavior towards others is expected at all times. Excessively rough play and loud, abusive, and foul language is strictly prohibited. 21. The pool manager and lifeguards are in charge at all times and have the authority to enforce all rules. 22. Failure to comply with any of the above may result in forfeiture of membership privileges. 23. Pool hours (weather permitting) are Monday thru Thursday noon – 8PM; Friday thru Sunday noon - 9PM. Weekday hours will be limited until the last day of Del. Public School. Please bulletin board for limited times. 24. Pool days (weather permitting) are the Saturday of Memorial Day weekend through Labor Day. 25. Members may host parties during normal pool hours and after hours. Members must chaperone children parties. The Pool Party Rental agreement must be completed and a $30 deposit must be submitted at least a week prior to the event date. After hour parties or parties consisting of 25 or more guests will require the hiring of additional life guards at your expense. A guest fee will be charged for non-members. Reservations must be made with the Pool Manager to ensure no conflicts. Please note: High Point Pool Membership is required to host a party. 26. Ice Cream is sold at 2:00, 4:00 and 7:00. Pre-paid chit cards are available from the life guards. 27. Propane grills are available for all members & guests. Please be courteous and clean the grill after use. 28. The High Point Hammerheads swim team competes in the North Brandywine Swim League. The team is open to all member children ages 6 through 18. See swim team literature for details. All children are encouraged to participate. 29. Life guards provide group and private swim lessons. Children will be grouped according to swimming ability and age. Details will be posted on the bulletin board. Please see lifeguards for information. 30. The pool provides water balls, ping pong balls & paddles, shuffleboard sticks & pucks, basketballs, etc. Please return the items that you borrow for the consideration of other members. Please do not hang on the basketball nets. 31. Clothing and other personal belongings that remain at the pool at closing will be collected in our lost-and-found bins. At the end of each of the season all unclaimed items will be donated to a local charity.